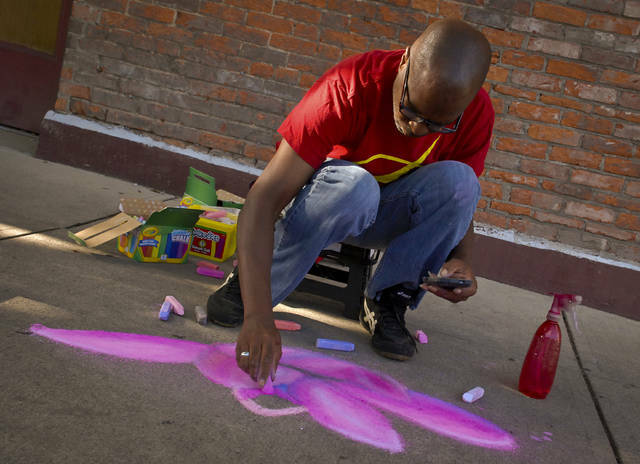 Settling into a place with lighter foot traffic along William Street next to Barley Hopsters, Myke Flournoy sketches a flower for the Main Street Delaware First Friday chalk art contest. Flournoy said he has been creating art ever since he can remember and the event was the second time he has entered the First Friday contest. July’s First Friday chalk art theme was postponed due to a heavy downpour of rain and rescheduled for the First Friday in August. This entry was tagged Chalk Art, delaware, first friday. Bookmark the permalink.